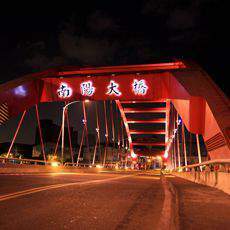 Jinshi Bridge owns the only on-bridge waterfall in Taiwan. 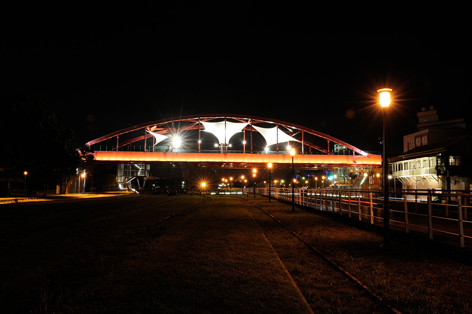 The colorful water dance gives the bridge fascinating and charming look at night. 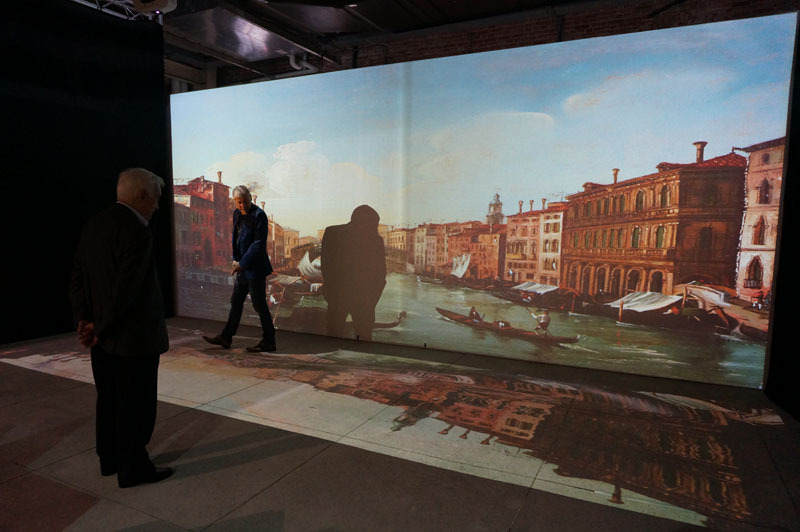 Interactive projection make the masterpiece more fun. 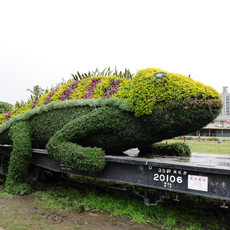 Used to be an important traffic arteries in Kaohsiung, Gon-Yuan Overpass has now transformed into a landscape space after 38 years. 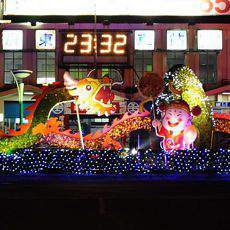 Where technology meets traditional culture. 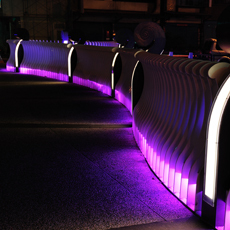 The project were designed to use spotlights with 3000K warm white color temperatures. 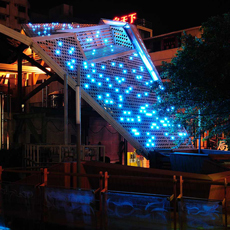 Wan-Nian Landscape Bridge is decorated with LED spotty lights and RGB projection lights. 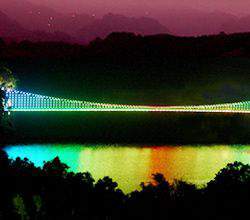 The bridge looks like a colourful galaxy at night. 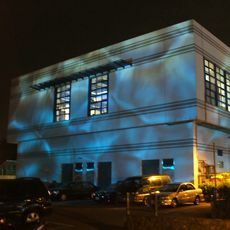 Rooster’s professional lighting team created the water waves effects outside the building. 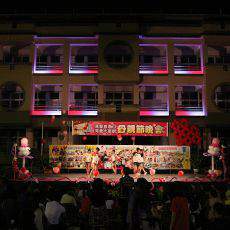 It added the charming atmosphere to the night. 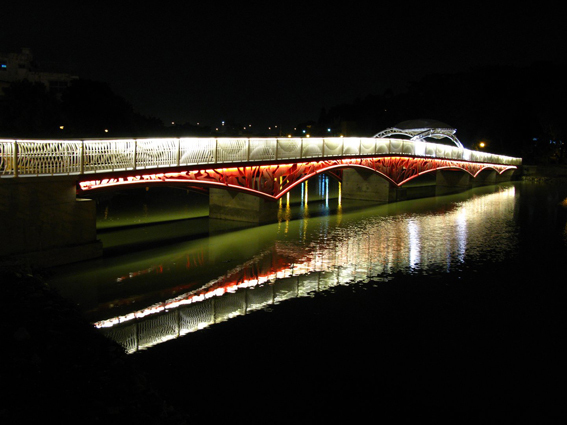 Wan-Fu Bridge Lighting Design with RGB LED + DMX control. 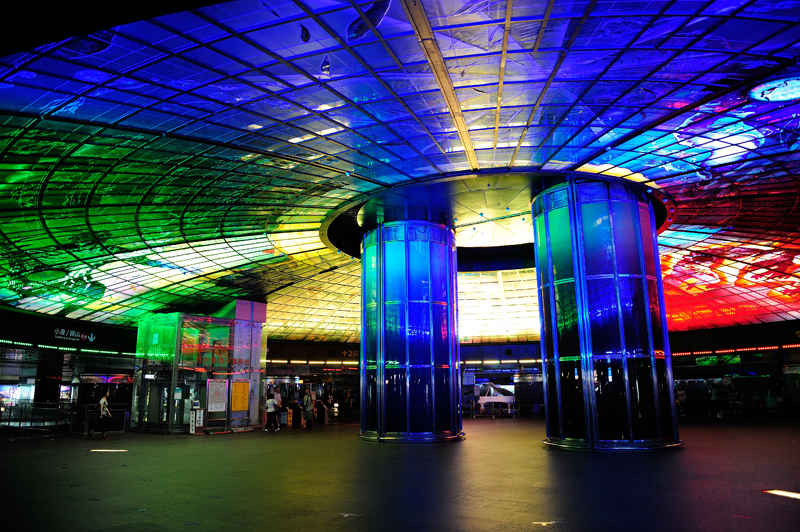 Mother's Day is an meaningful and educational activity, so we specifically propose the "lighting show" to school. 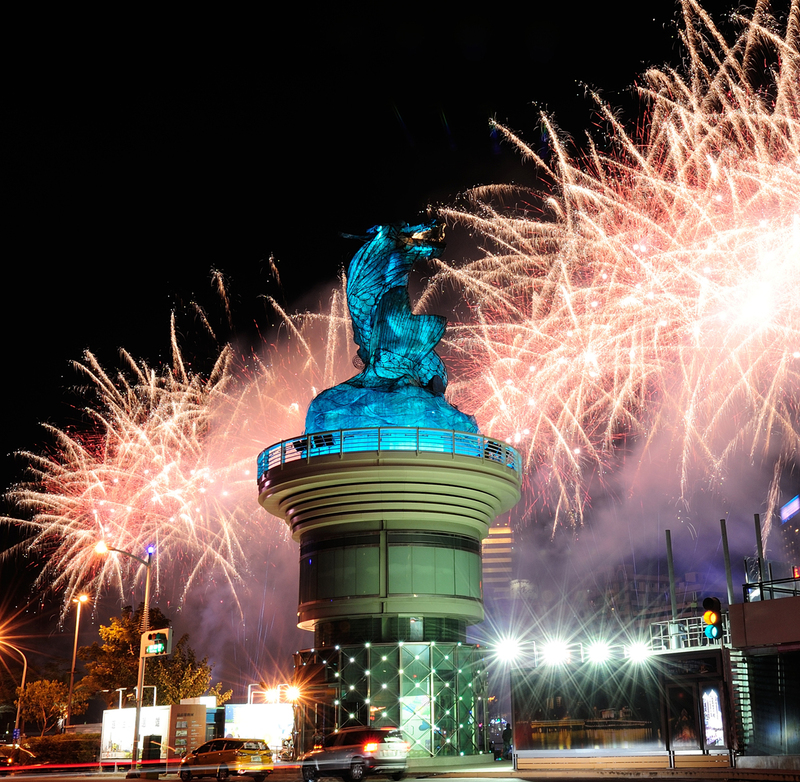 The whole event gave all audiences an unforgettable evening. 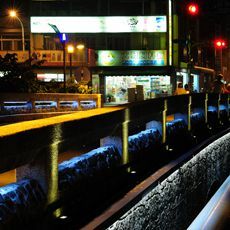 We used the latest LED lighting with computer programming technology gives this plain waterpipe bridge a total new look. 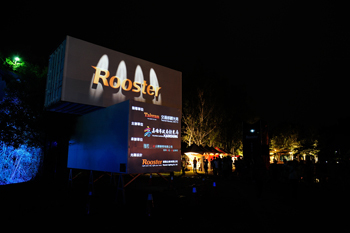 As the Pingtung local company, ROOSTER had successfully presented our creativity and lighting technology to create something special for the hometown. 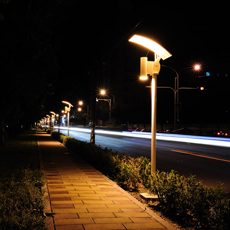 The innovative street lighting solution that combines streetlight, road sign and traffic lights. 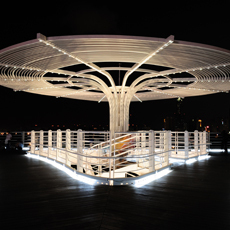 Design inspired by Taiwanese aboriginal culture and turned into interactive projection mapping "Magic Carpet", Light Sculpture & Chirstmas decoration. 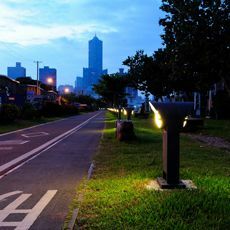 Based on the sustainable design philosophy, ROOSTER has developed series of innovative Multi-functional streetlights to solve this issue. 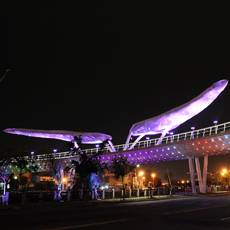 The landscape bridge in Yuangang fishing port is a arched and cable-stayed bridge dressed up with colorful lamps that outlined the prosperous and hopeful night. Brilliant light praise the grace of water. 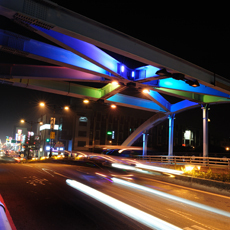 We created an unconventional light pole for Kaoping Bridge, which connects Kaohsiung and Pingtung City in southern Taiwan. To get rid of traditional window display method. 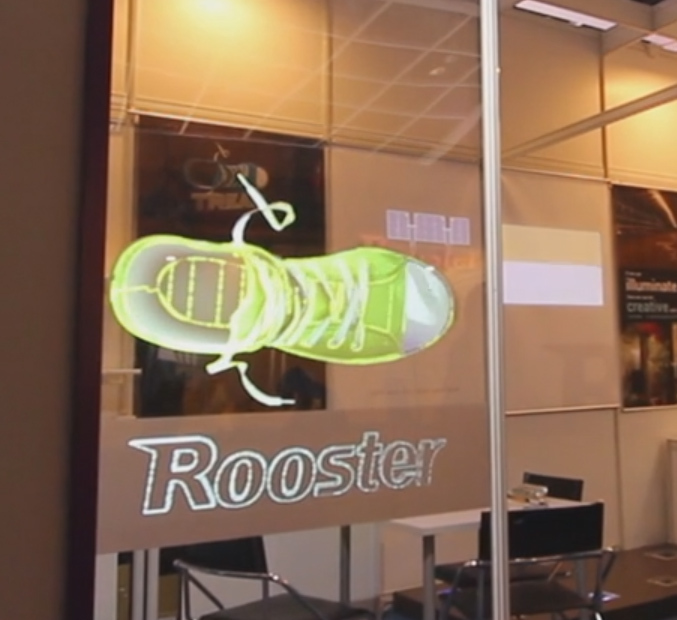 Use a new and more attractive way to present the products. 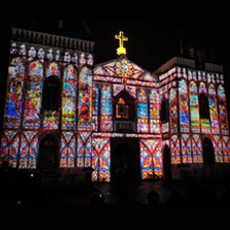 Rooster's festival fighting design with projection mapping technique to celebrate 2013 Christmas at the Catholic Church of Wanchin. 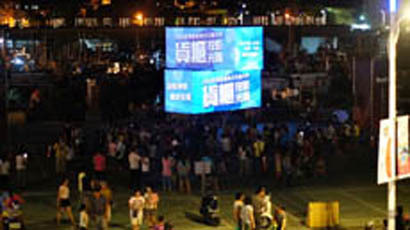 Through the unique portable container projection mapping technique, people get to know more about the Bluefin Tuna's knowledge and resources. 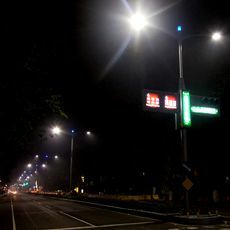 Rooster Lighting, as the local company is happy to participate in this educational and conservational environmental reform plan. 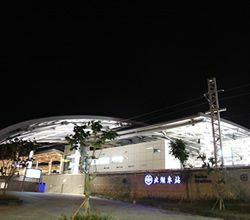 Refreshed Shin Guan Pier with the newly finished Kaohsiung Exhibition centre, the whole area has become a new tourism spot in Kaohsiung City. 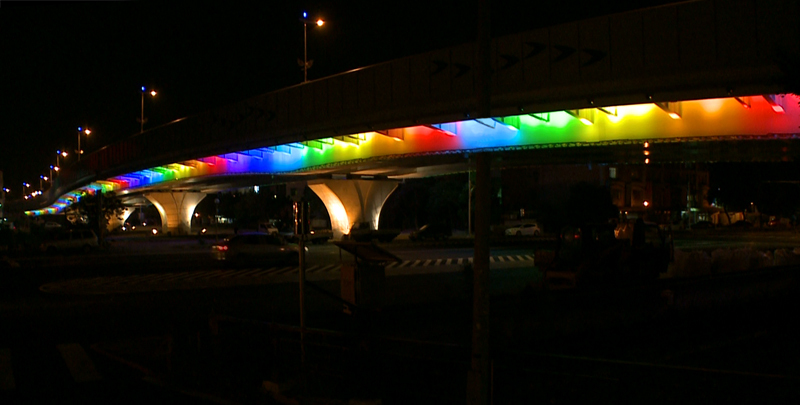 We brought the rainbow across Dong-Gang Greek at night. 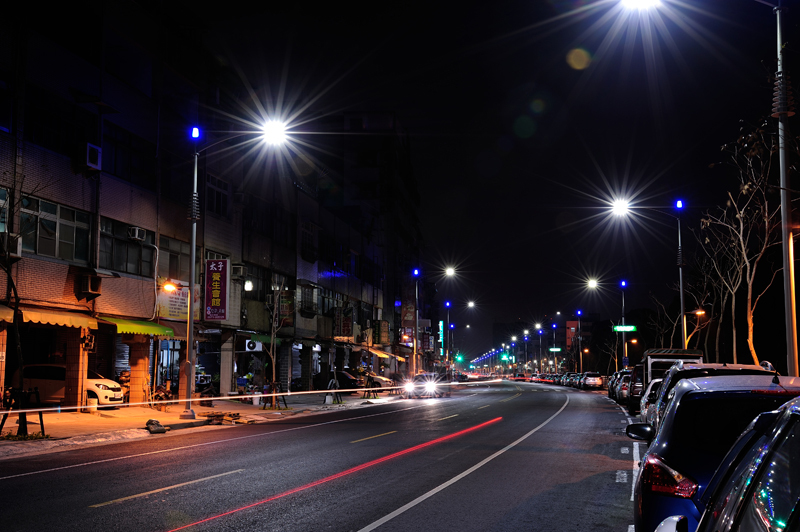 Providing a safer nighttime environment, and comfortable nighttime experience for Pingtung citizens. 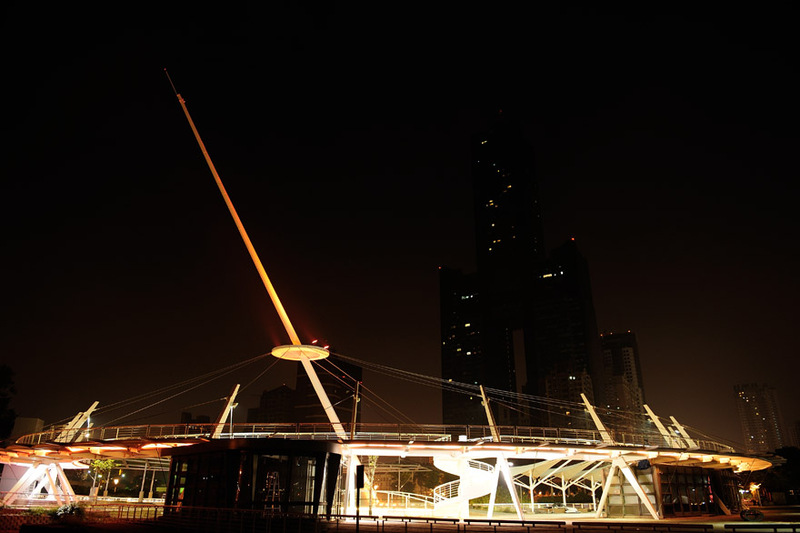 The interaction of lights and water brings out the most beautiful night view to the city. 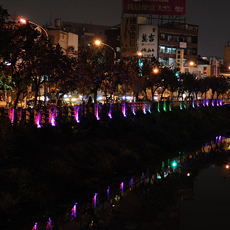 Love River is a famous tourism spot in Kaohsiung City. 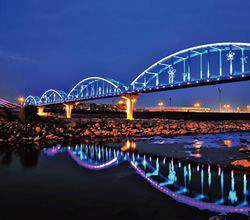 The sewage interception which played an important role in beautifying the river has also become a major tourism feature. 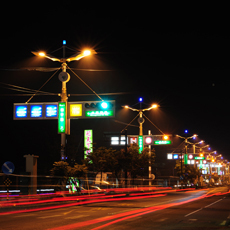 Wan-Nian Creek, the most recognisable blue highway in Pingtung City. 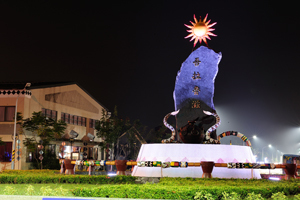 The round solar brick lights are added as chameleon's eyes and give visitors incredible surprises. 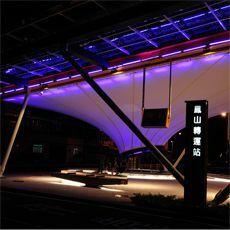 Entrance and Road Lighting Design creates the nighttime charm for Datan Industrial Park, Taoyuan. 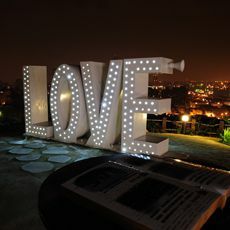 The LOVE observation deck locates at Shoushan (Monkey Mountain) offers visitors' a great lookout place to oversee beautiful Kaohsiung landscape. 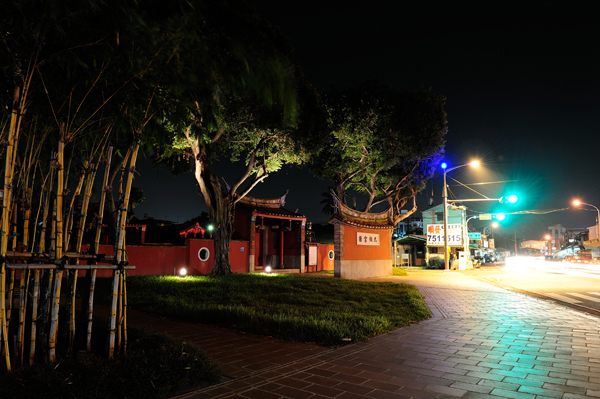 Falling in love with Kaohsiung pretty romance because of light. 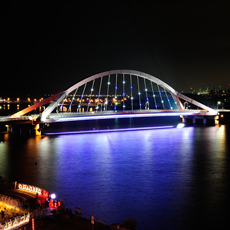 Love River in the night time is the brilliant pride of Kaohsiung. 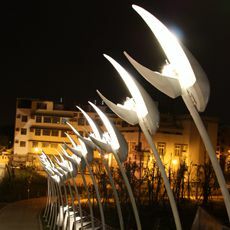 Not only the building, Mr. Chang Ma Long, who is the architect of this art center also has special requirement in making the “pea sprouts” shape landscape lights in order to fit into his unique architectural design. 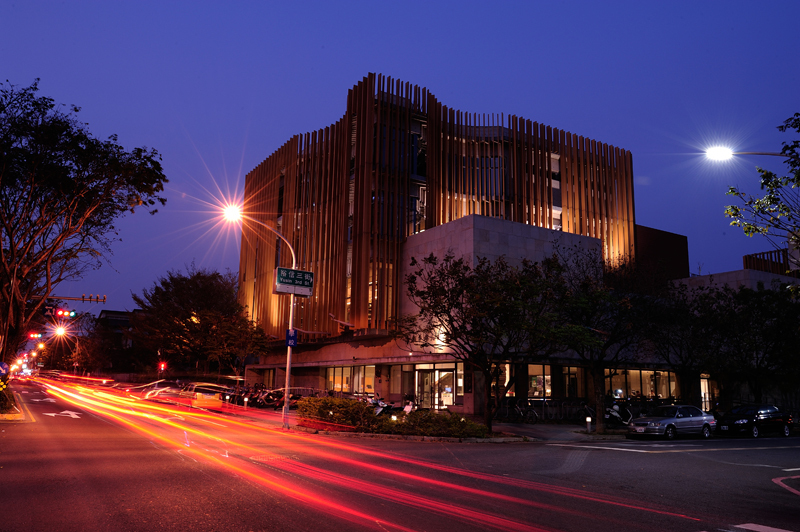 Preserving the local history and culture while adding the new elements, this site transformation design has received the 2012 Architectural Yuan Yie Award. 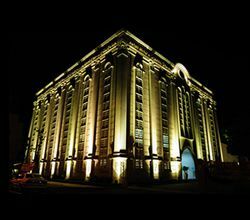 We always starts from designer’s point of view, sets off the architecture with delicate lights to show the building’s character. 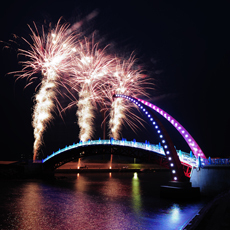 The colorful lightscribe bridges made the night in New Taipei City more brilliant. 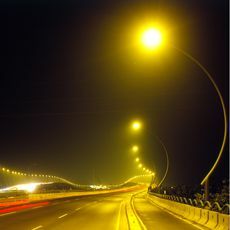 Making Nan-Yang Bridge exudes a unique glow with magnificent look, and a better glare-free driving experience for the bridge users.